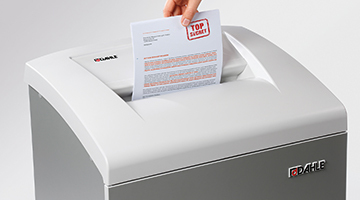 Dahle Canada paper shredders are your best line of defence in preventing unauthorized access to secure information. Whether it's personal credit card statements or Top Secret government documents, Dahle Canada has a shredder that will meet your needs. RCMP Government of Canada approved shredders. Dahle Office Shredders use the latest technology. Some models feature full electronic capabilities including such safety features as Automatic Shutoff when the cabinet door opens and Auto Reverse to prevent an overfeed. Automatic On/Off and Bag Full Auto Off are features that offer both convenience and satisfaction in knowing you will be notified when it’s time to empty the box or change the bag. For immediate assistance in choosing the Dahle Shredder that best fits your needs, contact CRD Distribution Inc. Premium, innovative staplers and office equipment. CRD Distribution Inc. provides shipping and quality service to all provinces and major cities across Canada. We offer service and maintenance for all makes of shredders by our dedicated Technicians in the National Capital Region of Ottawa.